Blue Fescue Festuca Glauca Varna is mound-forming, semi-evergreen, perennial ornamental grass. 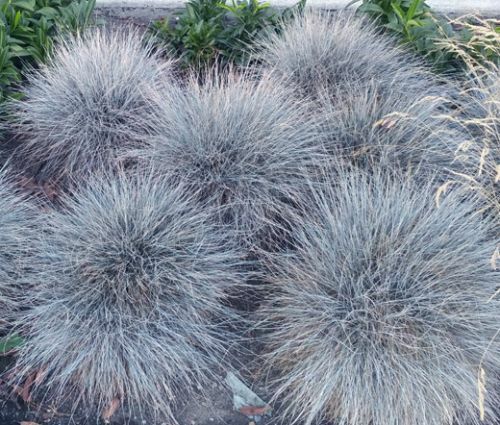 Blue Fescue seeds germinate fast, and the established Festuca Glauca Varna forms low-growing clumps of blue-gray foliage that is very ornamental. The flowers are insignificant, so they have to be removed to help retain the mound-like effect. Festuca Glauca adds more green color to its foliage during winter period. Blue Fescue is used as accent and specimen plantings in the foreground of borders and rock gardens, or this compact, clumping grass can be grown as a ground cover. Festuca Glauca seeds must be kept moist until germination. Blue Fescue is the small-scale ornamental grass that produces big-time results in the garden, and since Fescue is very shade and drought tolerant, it is often found in the dry shade of trees.